The majority of the information contained in this web article was provided by Mr Roger Gooden to whom the ODHS is deeply indebted. Roger is a grandson of Mr J J Garner and the Society particularly wishes to thank him for his diligent work in disseminating and collating information from family records for inclusion here. Thanks are also due to Dora Crawford and Gillian Thomas for their assistance in preparing the text. 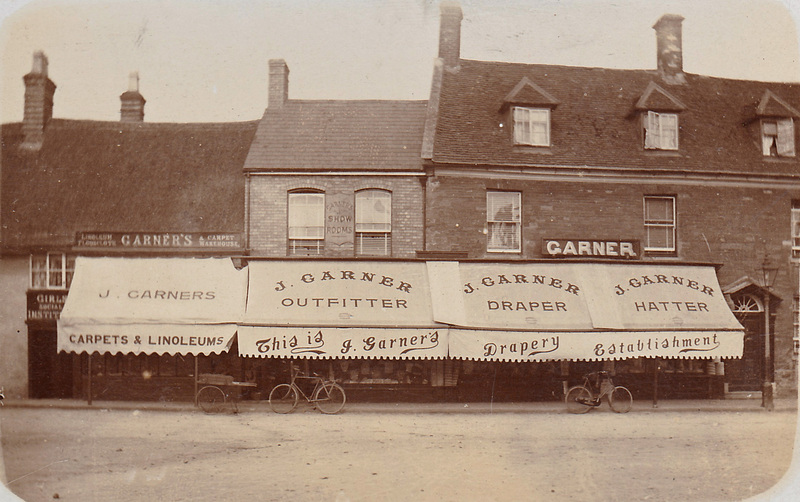 Garner’s was an extensive drapery shop situated on the eastern side of the Market Place at Numbers 21 and 22. The business was founded by Joseph James Garner on 28th August 1886 and finally closed its doors in 1972. Mr Garner (he was always known as Mr Garner) was an ambitious, diligent and particularly hard working draper. 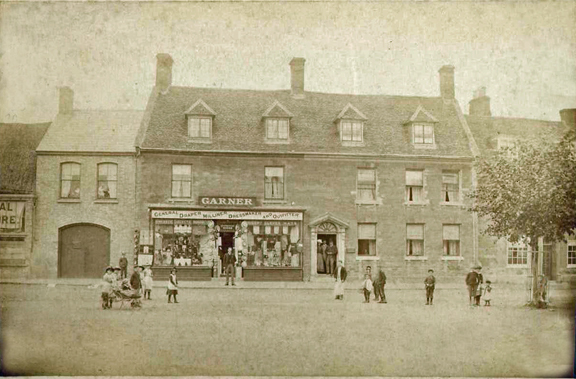 During the first half of the twentieth century, Garner’s was one of four particularly large shops in Olney. The other three were J W & E Sowman the ironmongers, Allens the outfitters and the Co-operative grocery store. Sowmans was situated on the south side of the Market Place at Numbers 32, 33 and 34, their shopfront is now several individual units; Number 33 is now the Derby House Saddlery. Allens, the ladies and gentlemen’s outfitting business on the west side of the Market Place at Numbers 5 and 6 is still going strong. The Co-operative grocery store has moved to a site behind Allens; the original shopfront on the east side of the High Street at Numbers 16 and 18 is individual shop units and includes Age (UK). Mr Garner outside the door of his newly opened shop in 1886. Mr Garner lived above the shop. His parents and brother are standing in the doorway of their home. The children appear to be dressed in their ‘Sunday Best’. Fortunately, the development of Garner’s business is reasonably well documented in articles in the local press and trade magazines. Three such articles are presented on this website. Not only do the articles give an account of the the development of the business and the drapery trade in Olney during this period, but they also give a clear indication of the social culture within Olney, where probably in those days Olney residents needed to ‘know their place’. 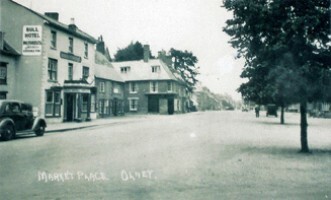 Because of its relative isolation, many aspects of the ‘deference society’ persisted in Olney well into the 1950s, even though the town was largely uninfluenced by the authority of country manor houses. The extensive development of the Garner properties over the years capitalised on the expanding business activities and is also covered in this article. 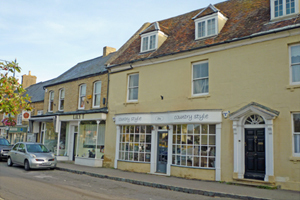 The business developed from a shop with a frontage of a single window to one with the largest frontage in the town. The frontage is currently a series of five individual shop units. The rear of the property was also extensively developed by Garner’s as a series of storerooms, which have now been converted into a small development called Rose Court, comprising mews shopping and a brasserie. Joseph Garner was a devoted and conscientious preacher in the Cowper Memorial Congregational Church sited in the High Street. Mr Garner’s activities associated with the Congregational Church and the Congregational Union were well reported in the local newspaper ‘The Bucks Standard’ and are reproduced in this article. Fortunately Mr Garner kept a diary of events, although perhaps it could more accurately be described as a daily log of events and occurences regarding his drapery business, the Market Place and the town of Olney in general. A good number of the diary entries are included in this article to provide an insight into his business operations, also to support the dates of notable events and the names and movements of his employees. After Mr J J Garner’s death in 1944 the business was run by his son Tom. Three of Tom’s letters to his parents whilst serving in the navy during WW1 are included in this article. The letters vividly describe the conditons to which servicemen were subjected at that time. Leslie and Iris Hamblin took over in 1957 and ran the business until it closed in 1972. 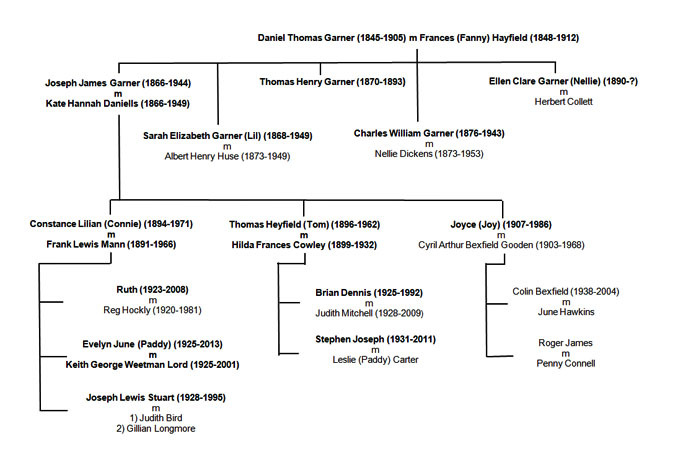 A Garner Family Tree for the period covered in this article is shown below. Residents in Olney during this period, ie: between 1881 and 1962, are shown in Bold. For readers’ convenience, this article is produced as a series of of web pages. These include several newspaper articles written during the ‘Garner years’ and it may come as no surprise that a degree of repetition occurs; for this we apologise and hope it does not impair the readers’ enjoyment. 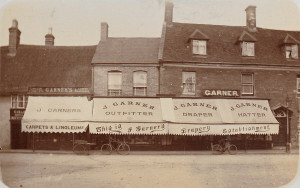 Joseph Garner carried on business in Olney for over 50 years, first as a draper, then he added outfitting, and finally he added a furnishing department. 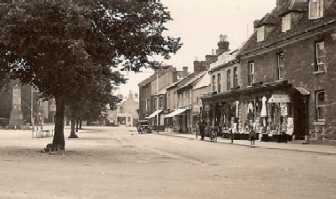 His shop was situated on the east side of the Market Place and had the largest shop frontage in the town. He was proud of being a Bucks man. Born at Newport Pagnell, he was educated at the British School in that town. In 1877 he won one of the first scholarships which entitled him to free education for three years. He forfeited part of this because he was determined to enter upon a business career at the early age of twelve. He first went to work for a printer and then in 1880 he went to work (probably as a ‘live-in’ apprentice) for Messrs AlIen & Vyle, drapers, in Buckingham and it is here that over a period of six years he had a good grounding in the trade of draper. On August 28th 1886 he moved to his premises in the Market Place in Olney to be a business man on his own account. It was from here that he took a prominent part in the business affairs of the town and he derived much happiness in assisting in many ways the advancement of the town of his adoption. 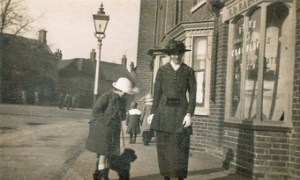 He often recalled that when he first came to Olney there was no Midland Road, no large factory at the corner, the streets were only paved in patches – cobble stones predominated – there were no sanitary arrangements, no water works, no electric light. In those days you had to mount stiles and cross fields to get to the railway station, and much of the shoe work was done by cobblers in their own homes. 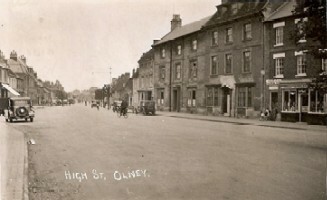 He was delighted to see Olney develop into an up-to-date country town with streets well cared for and tidy, the shops clean and bright, and the amenities of the old town vastly improved. He had a very happy relationship with his fellow traders and said “we are a very happy family, and we work together amicably and smoothly”. On the occasion of his jubilee as a trader the members of his staff presented him with a silver card case and their gift to Mrs Garner was a bouquet of golden flowers. 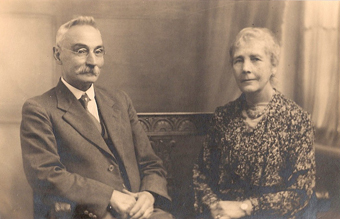 On May 31 1893 Joseph Garner married Miss Daniells, who, with a sister, carried on a dressmaking business in Olney. The service was conducted at Anerley Congregational Church by the then pastor of the Cowper Memorial Congregational Church at Olney, the Rev G G Horton. Joseph Garner was a devout Christian and a loyal Free Churchman. He was one of the pillars of the Congregational Church, which he served in every capacity as a layman. He was a teacher in the Sunday School, Superintendent of the Sunday School, a member of the Diaconate. He frequently presided at the organ for the Sunday services, and on several occasions he conducted the services of public worship when the pastorate was vacant. One of the greatest joys of his life was the prominent part he was privileged to take in the building of the Church School and the renovations of the church in 1906-8. 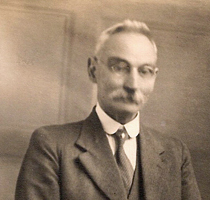 He was one of the earliest members of the Bucks Congregational Union, to which he gave splendid service as a member of the Executive. His interest in the various churches of the Union was recognised in 1911, when he was honoured by election to the Chairmanship of the Union. The English Sunday School Union marked his 50 years work in teaching the children the gospel truths by presenting him with its Certificate for long and faithful service. His greatest work for his own church at Olney was in connection with his long years of service as Secretary, and on the occasion of his retirement from active work in that capacity the church and congregation made him a handsome gift of an illuminated address on parchment, a cheque for £10/13/-, and a book of the names of the subscribers, on the leather binding of which was the letter “G” (also mentioned in the Church Honours web page). Whilst making the Congregational Church his chief concern in life, he also gave valued service in the town in many other directions. He was a great admirer of the poet Cowper and his love for the Cowper Museum was deep and enduring. He was curator and trustee and lost no opportunity in rendering service to help forward its prosperity. He was fond of taking parties from the various associations with which he was connected to the Museum; in fact all his visitors were led to the Cowper Museum. His death in 1944, after a long illness, was greatly mourned by the whole town. The business was carried on by his son Tom and then Leslie Hamblin but was sadly closed down in 1972, after which this large shop was divided up and let as smaller units. With regard to family, Joseph James and Katie Garner had three children; that is, one son and two daughters. His son Thomas (Tom) had two sons. Tom became involved in the business and took over when his father Joseph retired. His elder daughter Constance (Connie) had two daughters and one son, whilst his younger daughter Joyce (Joy) had two sons.